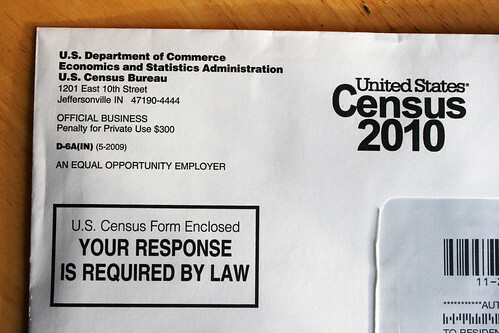 2010 Census envelope, Flickr photo by Quinn Dombrowski. As a real estate broker, one of the questions I hear frequently is: What is Bellingham’s population? Well, it fluctuates, but the official answer from the most recent census is out: 80,885 people. This is up 20.4 % from 67,171 people living in Bellingham in 2000. Keep in mind that the census counts college students living in Bellingham as residents if they live in Bellingham more time than any other place. However, many people are confused about census rules and the students end up being counted wherever their parents live. 14,575 students attend Western Washington University. In addition, we have a number of ‘snowbirds’ who live in Bellingham during the summer and somewhere sunny during the winter (a pretty good deal). They may be counted as Bellingham residents or they may not be. The census tries to address these issues, but no count is perfect. So, ‘around 80,000’ people is a great answer to the Bellingham population question. It may be a bit more at times, or a bit less when many students go home for the summer. I think it’s a great size for a small city/large town! For more information on the 2010 census results for Bellingham, Whatcom County and Washington State, check out this Bellingham Herald article: ‘2010 Census: Whatcom County grew 20.6 percent over past decade‘.